It’s Man Booker Prize longlist time and The Green Road is my first official read from the 13 books. Technically I attempted to read A Little Life a few months ago. I got to page 200 and got side tracked by other books and life and quit reading it. This is what can happen when I read more than one book at a time and when a story isn’t grabbing me. No worries I’ll surely get back to it eventually. I was away in the south of France with no internet and poor network connection for my smart phone so of course that allowed me to fully concentrate on reading. And boy did I read. I read four books in a week. That’s a record for me. You’ll hear about what I read in another post. 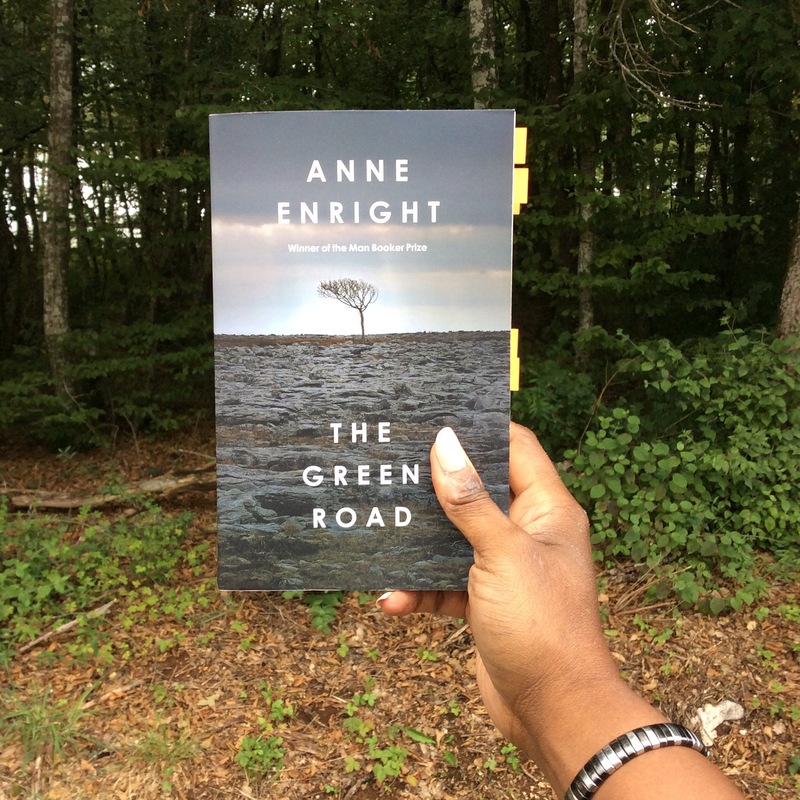 I’m back today to talk to you about what I thought of The Green Road by Anne Enright. The story is split up into two parts. The first part is composed of five view points from the Madigan family – from the children, Dan, Emmet, Constance, Hanna, and the last viewpoint is from the mother, Rosaleen. Part one is called Leaving and part two is called Coming Home. Part two is a series of episodes that tie up or make clear how each person fits into the Madigan family. “This is how they knew each other, the Madigans, they knew the timber of a voice, the rhythm of fingers tapping on a tabletop, and they didn’t know each other at all. Not really. But they liked each other well enough. Apparently.” ‘The Green Road, p. 254) Each point of view in Part one is told from the third person, making the characters difficult to care about. Not to mention their voices don’t show enough of who they are individually, much less how they fit together in the family. I think I would have preferred their points of view to be told in first person to really get into their heads. In spite of this, Enright does paint an intricate picture of family. She writes those touches of language that make The Green Road a type of classic tale of an Irish family, while at the same time trying to give the Madigan family specificities. The structure of the novel is what it has going for it. The writing is good, but not brilliant and the reader must piece together the family story. That seems to be a metaphor for this family’s lack of togetherness. The family is in pieces in the same deconstructed manner of the storytelling. As we meet each member we are trying to figure out what’s gone wrong and why. That is the difficulty of the book, which may put some readers off. Through each section the reader is bombarded with a lot of information about that family member and themes from alcoholism, homosexuality, illness, etc. We learn about each family member at different time periods and their relationships to their husbands, children, girlfriends, etc.. I believe Enright complicated the story of the Madigans, henceforth rendering it uninteresting. Moreover, I would be very surprised if this novel makes it on to the shortlist. I didn’t give a hoot about any of the people I was reading about and the ending fizzled out into something that seemed to be thrown together to round the story off to a complete finish, making for a really dry ending. I’ll be extremely surprised if The Green Road makes it further. I’m not sad that I read it because now I’m interested in picking up The Gathering, for which Enright won the 2007 Man Booker prize. Hoping that I’ll enjoy that one more. I’d like to see what a winner from her is really like. It seems that there is a strong theme around family in this year’s Man Booker 2015 longlist. I still have 2 others that treat the subject of family left to read on my wish list – Did You Ever Have a Family and A Spool of Blue Thread (unfortunately I hear this one is uneventful) I won’t be reading the entire longlist because there are some I’m not interested in at all. I hope they will be more interesting than The Green Road. . Could it be for The Green Road that I’ve missed some extremely important Irish references? Possibly. So have you read anything from the Man Booker 2015 longest? If so what? Have you read The Green Road? What did you think of it? Oh, Didi…I am so glad I read your review. I read about 33 percent of it and put it down. There was not one character I cared about and I did not feel like investing my time to find out about them. Also, the life of Dan was just pure nastiness. The story of his entry into the clerical life would have greatly interested me instead of the deviant turn it took. Sadly it was a bit of a bust. I didn’t like how you don’t see how and why things change for the characters. It’s written in a very peculiar manner. This book is missing a soul. No worries Joseph don’t bother. I’m currently reading Sleeping on Jupiter and finding the writing beautiful…. I keep meaning to read this and then choosing something else. Your review is intriguing me. Might have to pick this one up soon. Also, I’m super jealous of your time in the south of france without internet! Glorious! Yes that down time in the south of France is always good for my reading and relaxation. The weather however wasn’t totally great because we had a couple of days are hard long lasting rain. The other days were scorchers – typical south east summer weather. As for The Green Road good luck with it. Missed some soul for me. I hit ‘enter’ way too fast on that comment 😉 The review did intrigue me – I like stories of complicated families. But if there wasn’t anything to connect to, then I can probably skip it and save some time for another book! I second that. Skip it! I have crossed this one off my ‘ short list ‘ and moving on to B. Clegg. That one has potential. Still my vote goes to A Little Life as TOP book. Thanks for The Green Road review….saves me some precious reading time! Ok noted! Didn’t know you were interested in the Man Booker longlist. ? Hi Didi! – glad to hear you’ve returned from some time well-spent in the south of France. Even though it rained and you didn’t have internet access I like the idea of “being away from it all” and cleansing one’s senses by being in a different environment and having one’s habitual rhythms broken-up. The other side of that means renewed energy! or am I just projecting my fantasy onto you?-lol! :)….oh, about The Green Road….so I don’t like books that are hollow of soul. Why do you think this book made the [Man Booker Prize] longlist at all? I have no unearthly idea. However, someone told me they like authors who have studied creative writing from a particular school whose name escapes me. That definitely wouldn’t be a criteria for me. Yes I feel a little rejuvenated but packing my daughter to Paris is starting to exhaust me. So many things to do.not back to work yet so reading steadily.? I have linked your review to my Man Booker Prize post. I’m not reading the book but would like others to read your review. If you have any objections to the link….just let me know and I will remove it. You have saved me many hours reading time that I can spend on the ‘classics’. I have avoided them the last few months reading French, Nobels and Pultizer Prize books. I have spent the past few weeks lying in the sun reading, I am pleased to say that I finished this book….it wasn’t difficult to read but it was a bit of a let down and perhaps not Booker prize-winning material. I had to read a synopsis of the story to remember the names and the story line, so it failed to make any lasting impression. In comparison, I was deeply moved by “The Narrow Road to the Deep North”, a worthy Booker winner, and I often think of the characters and certain particularly harrowing parts of the novel . I am currently reading “A Little Life” and it too is taking me on an emotional roller coaster. I agree no sparks for The Green Road at all. however The Narrow Road to the Deep North and A Little Life are on my TBR. Hope to get to them both soon. Will you be reading any other Man Booker longlist novels? II have spent the past few weeks lying in the sun reading, I am pleased to say that I finished this book….it wasn’t difficult to read but it was a bit of a let down and perhaps not Booker prize-winning material. I had to read a synopsis of the story to remember the names and the story line, so it failed to make any lasting impression. In comparison, I was deeply moved by “The Narrow Road to the Deep North”, a worthy Booker winner, and I often think of the characters and certain particularly harrowing parts of the novel . I am currently reading “A Little Life” and it too is taking me on an emotional roller coaster. I would like to read “Did you ever have a family” and “The year of the runaways”. I loved your review. I just finished The Green Road last night and my thoughts are completely in synch with yours. I plan to read The Gathering as well, since The Green Road was my first Enright book and she has just recently been made Laureate of Irish Prose, so she must have something going for her. Did You Ever Have A Family was another book about family misery, which seems to be the theme the Man Booker committee was hooked on this year. Tyler’s book is quite good – her character development is superb. Stick with the book and although some may call it “uneventful,” they obviously have no souls. (kidding) There is a surprise about that spool of blue thread and Tyler masterfully reveals it a millimeter at a time. I think her book is more truthful or at least more common about family than Enright’s or Clegg’s. I would love to know what you think about both Clegg’s and Tyler’s books after you read them. I will check back. Thanks! Will be getting to these two hopefully before the end of the year. I think people criticized Tyler’s book mostly because they didn’t think her writing was so spectacular, especially not for the Man Booker. I think they were expecting a lot more from her in the writing. I think another problem was that this is her usual story to tell and apparently she’s done it a lot better in her other works is what I hear. Nevertheless I will be sure to review them on here. Have you picked up The Fishermen yWhat did you think of it or are you planning to read it? I’m reading it at the moment. I plan to read The Fishermen and will let you know. You make good points about Tyler but I still feel her book was superior to most of those Booker candidates. Clegg’s book was full of cliches, sometimes he used two cliches in one sentence – certainly not worthy of a literary prize. I think the Booker, like the Pulitzer and other awards, has devolved into political correctness. The Goldfinch was a horrible book in my opinion. The first third was well written but then she sunk into a YA trashy novel. Will check in with you soon! Interesting point.Haven’t read Tyler’s book but from what I’ve heard about it, it doesn’t sound like a Man Booker shortlist book. Anyway, I’m planning on reading it so that I can pass better judgment. Haven’t picked up The Goldfinch either because the hype was so real I became disinterested in picking it up. I’m only a third through The Fisherman. Have put it on hold because I’m reading Fever for Saturday alongside Fates and Furies, while working like crazy. You’ll see the reviews when I’m done.